Kim Kardashian's daughter North is her fashion mini-me in this adorable outfit | HELLO! 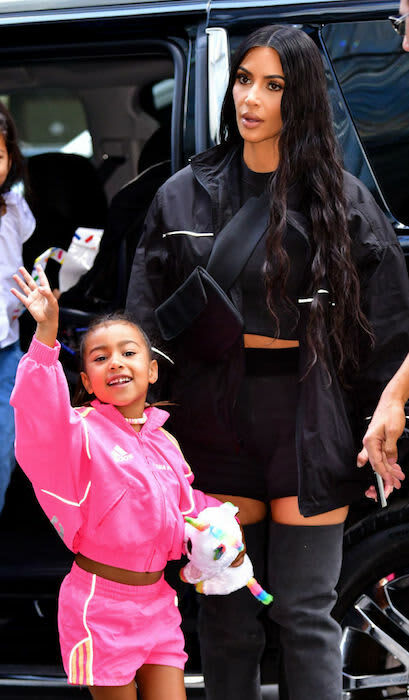 Kim Kardashian-West's daughter North has been rocking the catwalk's finest since she entered this world, practically, but even we can't handle the cuteness of her latest outfit - this adorable bright pink Adidas shorts tracksuit, complete with braided ponytail and maximum sass. We're getting miniature sports-luxe vibes from the five-year-old (is this even possible?) - who is clearly taking after her mum when it comes to her sense of style. 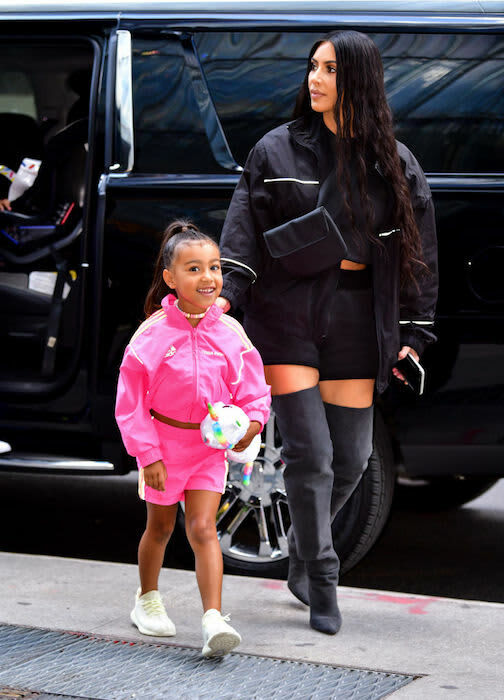 Kim even decided to match her little girl with a sports set of her own, though she teamed hers with thigh-high boots, of course, for that Kardashian touch. Little North was more than happy to wave at the cameras as she stepped out the car with her mum in Manhattan - giggling away and even cheekily telling one photographer to "shhh!" as she left the hotel with Kim. Since Friday is North's 5th birthday, the mum and daughter duo were out to celebrate - Kim's Instagram stories show the pair making ice cream together at New York's sweet foodie spot Cool Mess. Aw. The mum-of-three loves dressing North up in adorable outfits - and often showcases the little girl's various designer gifts on Instagram - but also recently revealed that she repurposes her own dresses so her daughter can wear them. "It's been such a fun journey to figure out how our kids like to dress and how to make cool clothes for kids," she told T Singapore, The New York Times Style magazine. "We've always been tailoring things and cutting things up, or taking dresses of mine and cutting them down to North's size." Kim and Kanye have found huge success designing clothes for kids, launching their childrenswear line, Kids Supply, in 2017. READ MORE: North West gives her first interview alongside Kim Kardashian and her answers are the cutest!